Total knee arthroplasty significantly improves functional outcomes in obese patients, but is also riskier than in normal-weight patients. As the number of obese patients with knee osteoarthritis continues to rise, clinicians are being challenged to find a balance between the risks and the benefits. Figure 1. 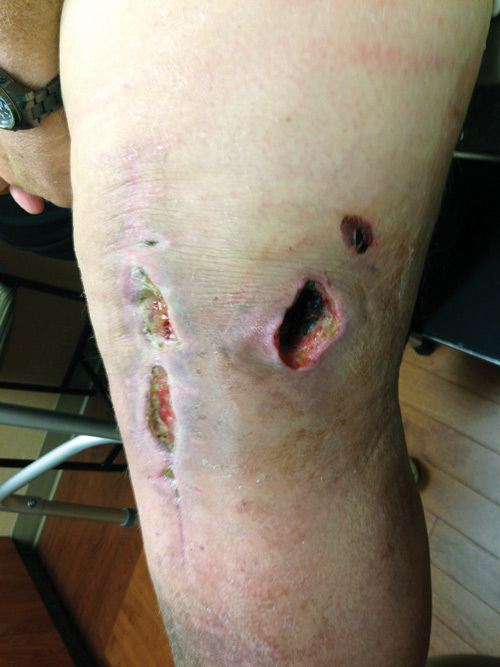 A wound healing complication in an obese total knee replacement patient. Evidence shows that increased body weight and obesity are associated with osteoarthritis (OA) of the knee and, ultimately, the need for TKA. In 1988, Felson and Anderson first reported obesity as an independent risk factor for the development of OA.11 In this seminal analysis of the Framingham Study population, the authors reported that, after controlling for age, men in the highest relative, or height-adjusted, body-weight quintile had 1.5 times the risk of developing OA while women in the highest relative body-weight quintile were twice as likely to develop knee OA as individuals with lower relative body weight. Coggon et al conducted a matched case-control study and found that individuals with a BMI of 36 or higher had a nearly 14 times higher risk of developing knee OA than individuals with a BMI between 24 and 24.9.12 Moreover, the authors concluded that if all people with a BMI of 30 or higher reduced their BMI to within the recommended normal range (18.5 to 24.9) 24% of TKA procedures for OA might be avoided.12 On average, knee OA patients with a BMI of 35 or higher may need TKA surgery seven years earlier than those with BMI levels of less than 25.13 Although TKA implants are designed to last for upwards of 20 years, those who have surgery at younger ages, independent of other risk factors, are more susceptible to additional revision surgery. Patients with BMIs greater than 40 have less functional improvement than patients with lower BMIs, and their rate of improvement is slower.3,14,16 Obese patients undergoing TKA also have an increased risk of medical perioperative complications, such as poor wound healing, infection, respiratory complications, and venous thromboembolism. However, the well-documented increased risk of complications must be evaluated in a medical context; obesity is associated with other comorbid medical conditions that also independently increase the risk of complications.3,14,16 Figure 1 illustrates a wound healing complication in an obese total knee replacement patient. Figure 2. 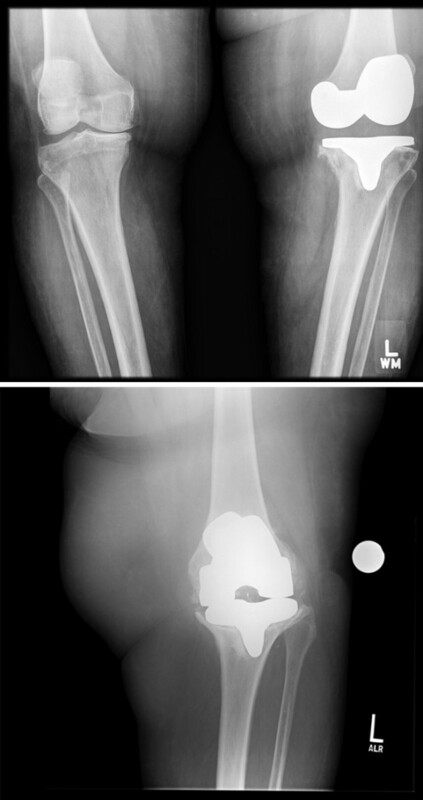 Radiographic images of an aseptically loose tibial implant in a morbidly obese patient. The primary mechanical failure mechanism of TKA is loosening of the implant from the bone or the cement placed around the implant during surgery.21 Although failure of TKA due to loosening is possible in any patient, those patients with elevated BMIs are at a higher risk.22 Figure 2 shows two radio­graphic images of an aseptically loose tibial implant in a morbidly obese patient. We posit three potential outcomes for patients who are denied TKA based on their having a BMI of 40 or higher and other associated comorbidities: 1) The patient chooses to seek a second opinion and have total joint arthroplasty performed at another institution. 2) The patient chooses to seek appropriate medical options such as medical weight management counseling, bariatric surgery, or both, and achieves successful weight reduction to meet the total joint arthroplasty healthy BMI threshold (BMI less than 40). 3) The patient chooses to seek appropriate medical options such as medical weight management counseling and/or bariatric surgery, but is unable to achieve successful weight reduction to meet the total joint arthroplasty healthy BMI threshold. We propose that this last group of patients is the cohort that is most concerning and may benefit most from a targeted care pathway and a multidisciplinary medical weight loss management team. This healthcare team should include an orthopedic surgeon, bariatric surgeon, registered dietitian, exercise specialist, and mental health provider who can in concert provide comprehensive support for the morbidly obese patient to safely achieve the target body weight and BMI required for a safe and effective TKA that can improve quality of life. We are in the initial stages of developing such a program at our institution. Recently, the American Medical Association officially categorized obesity, defined as a BMI of 30 or higher, as a disease.27 Proponents of the decision believe this move will encourage physicians to pay closer attention to obesity and enhance their patient counseling methods. Opponents suggest that the measure that is used to define obesity, i.e., BMI, is flawed.27 A patient with a considerably elevated BMI can be perfectly healthy, while a patient with a moderately elevated BMI may have related metabolic disorder and a number of associated comorbid conditions that increase the risk of complications.3,14 Therefore, opponents suggest that changing the categorization of obesity from a condition to a disease will have little impact.27 Nevertheless, the increased awareness of obesity as a public health concern can only help those who seek a healthy way to decrease their body weight and BMI,27 particularly those who are candidates for TKA. Susan M. Odum, PhD, is the senior research scientist and outcomes research manager for the OrthoCarolina Research Institute in Charlotte, NC, and serves as part-time associate graduate faculty in the College of Health and Human Services at the University of North Carolina at Charlotte. Bryan D. Springer, MD, specializes in total joint replacement surgery at the OrthoCarolina Hip and Knee Center, where he is fellowship director. 1. Organization TWH. 10 Facts About Obesity. World Health organiation wensite. http://www.who.int/features/factfiles/obesity/facts/en/index.html. Accessed January 22, 2014. 2. Mason EE, Doherty C, Maher JW, et al. Super obesity and gastric reduction procedures. Gastroenterol Clin North Am 1987;16(3):495-502. 3. Workgroup of the American Association of Hip and Knee Surgeons Evidence Based Committee. Obesity and total joint arthroplasty: a literature based review. J Arthroplasty 2013;28(5):714-721. 4. Flegal KM, Carroll MD, Kit BK, Ogden CL. Prevalence of obesity and trends in the distribution of body mass index among US adults, 1999-2010. JAMA 2012;307(5):491-497. 5. Ogden CL, Carroll MD, Kit BK, Flegal KM. Prevalence of obesity in the United States, 2009-2010. NCHS Data Brief 2012;(82):1-8. 6. Ogden CL, Carroll MD, Kit BK, Flegal KM. Prevalence of obesity among adults: United States, 2011-2012. NCHS Data Brief 2013;(131):1-8. 7. Kurtz SM, Lau E, Ong K, et al. Future young patient demand for primary and revision joint replacement: national projections from 2010 to 2030. Clin Orthop Relat Res 2009;467(10):2606-2612. 8. Odum SM, Springer BD, Dennos AC, Fehring TK. National obesity trends in total knee arthroplasty. J Arthroplasty 2013;28(8 Suppl):148-151. 9. Fehring TK, Odum SM, Griffin WL, et al. The obesity epidemic: its effect on total joint arthroplasty. J Arthroplasty 2007;22(6 Suppl 2):71-76. 10. Ogden CL, Carroll MD, McDowell MA, Flegal KM. Obesity among adults in the United States— no change since 2003-2004. NCHS Data Drief. 2007;(1):1-8. 11. Anderson JJ, Felson DT. Factors associated with osteoarthritis of the knee in the first national Health and Nutrition Examination Survey (HANES I). Evidence for an association with overweight, race, and physical demands of work. Am J Epidemiol 1988;128(1):179-189. 12. Coggon D, Reading I, Croft P, et al. Knee osteoarthritis and obesity. Int J Obes Relat Metab Disord 2001;25(5):622-627. 13. Gandhi R, Wasserstein D, Razak F, et al. BMI independently predicts younger age at hip and knee replacement. Obesity 2010;18(12):2362-2366. 14. Yeung E, Thornton-Bott P, Walter WL. Patient obesity: a growing concern of successful total knee arthroplasty. Semin Arthroplasty 2010;21(2):87-91. 15. Pottie P, Presle N, Terlain B, et al. Obesity and osteoarthritis: more complex than predicted! Ann Rheum Dis 2006;65(11):1403-1405. 16. Gillespie GN, Porteous AJ. Obesity and knee arthroplasty. Knee 2007;14(2):81-86. 17. Collins RA, Walmsley PJ, Amin AK, et al. Does obesity influence clinical outcome at nine years following total knee replacement? J Bone Joint Surg Br 2012;94(10):1351-1355. 18. Nunez M, Lozano L, Nunez E, et al. Good quality of life in severely obese total knee replacement patients: a case-control study. Obes Surg 2011;21(8):1203-1208. 19. Järvenpää J, Kettunen J, Kröger H, Miettinen H. Obesity may impair the early outcome of total knee arthroplasty. Scand J Surg 2010;99(1):45-49. 20. Dorr LD, Boiardo RA. Technical considerations in total knee arthroplasty. Clin Orthop Relat Res 1986;(205):5-11. 21. Schroer WC, Berend KR, Lombardi AV, et al. Why are total knees failing today? Etiology of total knee revision in 2010 and 2011. J Arthroplasty. Sep 2013;28(8 Suppl):116-119. 22. McElroy MJ, Pivec R, Issa K, et al. The effects of obesity and morbid obesity on outcomes in TKA. J Knee Surg 2013;26(2):83-88. 23. Mulhall KJ, Ghomrawi HM, Mihalko W, et al. Adverse effects of increased body mass index and weight on survivorship of total knee arthroplasty and subsequent outcomes of revision TKA. J Knee Surg 2007;20(3):199-204. 24. Spicer DD, Pomeroy DL, Badenhausen WE, et al. Body mass index as a predictor of outcome in total knee replacement. Int Orthop 2001;25(4):246-249. 25. Bordini B, Stea S, Cremonini S, et al. Relationship between obesity and early failure of total knee prostheses. BMC Musculoskelet Disord 2009;10:29. 26. Foran JR, Mont MA, Etienne G, et al. The outcome of total knee arthroplasty in obese patients. J Bone Joint Surg Am 2004;86-A(8):1609-1615. 27. Pollack A. AMA recognizes obesity as a disease. The New York Times. 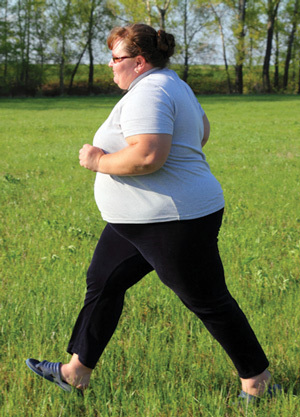 June 18, 2013. http://www.nytimes.com/2013/06/19/business/ama-recognizes-obesity-as-a-disease.html. Accessed January 22, 2014.